Recently I read about an amazing woman, Deborah Szekely, and I wanted to share her with you….. Heading towards her 91st birthday, Deborah glows with an energy that one rarely finds in someone half her age. She does Pilates three times a week and trains three times a week with a Navy Seal. She is an 90 year-old woman who is not only very wise but who also could do more push ups than most 50 year-olds. When she said “I know that eventually I will get old,” I knew I needed to pay attention. Deborah Szekely is the Brooklyn-born daughter of immigrant parents. Her father was in the garment business and her mother was a nurse and vice-president of a NYC vegetarian society. 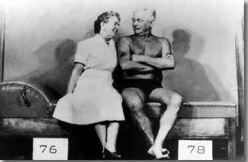 She lived on a beach in Tahiti as a child before moving back to the U.S. and married Edmond Szekely in 1939, a renowned health researcher, philosopher and author well-known for his theories of mind/body/spirit balance and living the longer healthier life. In 1940, they rented land in a then-remote mountain-ringed valley in Mexico and founded a “health camp” focused on exercise and healthy eating called Rancho La Puerta. The first guests arrived in June 1940, and the rest is a remarkable history of serving hundreds of thousands of guests in the past 70 years – and changing untold lives in the process. Today, the resort, still in its original location, has evolved into a premiere luxury spa and has garnered accolades such as the 2010 Travel + Leisure magazine Readers’ Poll “World’s Best Destination Spa” award. In 1960, working alone, Deborah established another spa, the Golden Door in Escondido, California – long considered one of the preeminent spa experiences in the world. Start it. Even if you don’t know what’s next, take the first step. Once you get going with a project you’ll figure out what’s next. “We didn’t know what we were building, we just did what needed to be done each day.” Seventy years later, those days have added up to create one of the world’s premier health spas and resorts. And, it all started from taking the first step. Take time for yourself. “Make time for you. Go outside in the morning and connect to Nature’s energy. Listen. Feel it. Problems will still be there but you get to share them in a different way.” When we connect to something bigger than us and take the time to go inside, we’ll find the answers we seek. Start your day with the right attitude. “Each morning when you wake, connect with your body. Spend a moment wiggling and say ‘Good Morning’. Expect it to be a good day and it will be.” Our attitude determines our outcome. « HAVING A BABY CHANGES YOUR BODY. NO SERIOUSLY. HAVING A BABY CHANGES YOUR BODY.